In Leicester, both the X-ray and Observation Astronomy (XROA) and Theoretical Astronomy groups study GRBs. XROA use a variety of satellite and ground-based observatories to study the multi-wavelength nature of the bursts, while the Theory group are involved in modelling the origin and evolution of GRBs. There is a departmental webpage about the GRB research performed in Leicester and some of the highlights are shown below. There is a BBC webpage about GRBs in general. On Christmas Day 2010, Swift detected an unusually long gamma-ray image trigger. A bright X-ray transient was detected, whose spectrum showed evidence for thermal emission in addition to the synchrotron power-law expected for a GRB. The optical counterpart was also unusual, evolving as an expanding and cooling blackbody, followed by the detection of a faint supernova. It is hypothesised that the progenitor of the event was a helium star/neutron star binary, which underwent a common envelope phase before the final merger which Swift detected as a GRB. 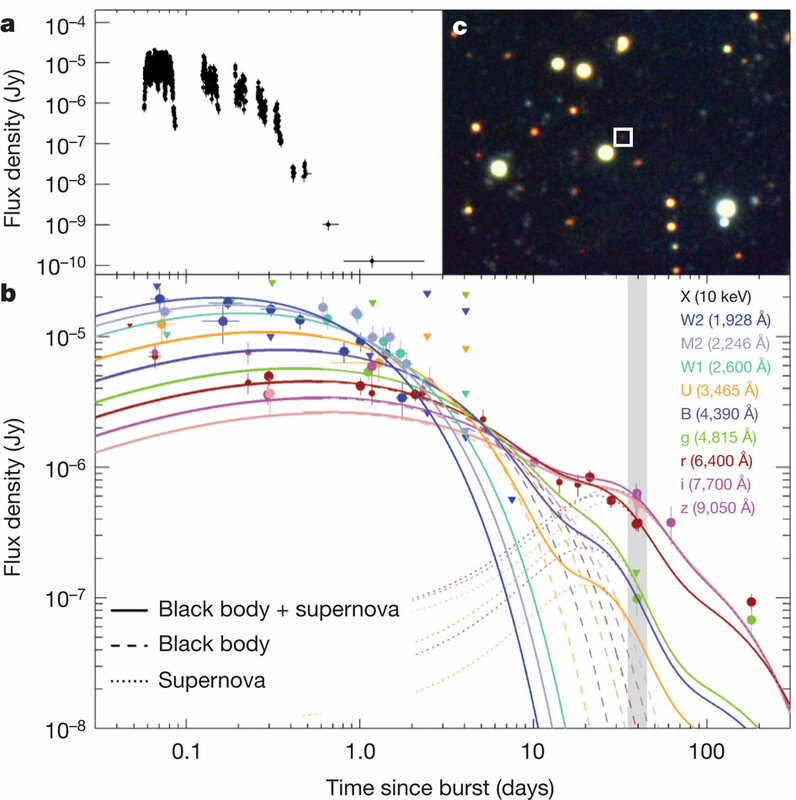 GRB 101225A thus appears to be a rare type of blackbody-dominated GRB which exploded in a dense environment previously created by its own progenitor system. The figure below was taken from Thöne et al. (2011), which provides more information about this peculiar event. GRBs have both "long" and "short" populations, with the dividing line being around a duration of 2 seconds. Although the majority of short bursts are thought to be formed during the merger of compact objects which then collapse directly into a black hole, some systems may form a magnetar - an unstable, millisecond pulsar - before the final collapse. Indeed, some long GRBs have also been proposed to pass through a magnetar phase. Rowlinson et al. (2010) and Lyons et al. (2010) investigate the possible magnetar connection with short and long bursts, respectively. GRBs 090429B and 090423 are the two most distant GRBs discovered to data, at redshifts of ~9.2 and 8.2 respectively, meaning the Universe was only 520 million years when GRB 090429B ocurred, and 640 million years old for GRB 090423. See Cucchiara et al. (2011) for more details on GRB 090429B and Tanvir et al. (2009) for GRB 090423. While individual GRBs can be extremely interesting, analysing samples can provide complementary information. Willingale et al. (2007) found that X-ray light-curves can be fitted using one or two components with the same functional form, comprising an exponential phase followed by a power-law decay. Evans et al. (2009) then continued this work, presenting a homogenous analysis of the automatically generated Swift X-ray light-curves (Evans et al. 2007) from the launch of the mission until July 2008 and discussing the different morphologies seen and how these can (or cannot!) be explained by the standard models. GRB 080307: the onset of the afterglow? GRB 080307 showed an unusual smooth rise in its X-ray afterglow, peaking a few hundred seconds after the trigger, at the start of which the emission briefly softened. This `hump' is unlike typical flares and can actually be modelled as the onset of the afterglow, something which is rarely seen in Swift data. The BAT-XRT is shown below, modelled with two components (shown as dashed lines): one for the prompt emission, one for the afterglow. See Page et al. 2009 for more details. GRB 070616 showed a complex multi-peaked prompt emission structure, with a very long duration of more than 400 seconds. Spectral and temporal evolution was followed in detail, and the plot below (Figure 3 from Starling et al. 2008) shows this clearly, with the X-ray data plotted in red and the gamma-rays in grey. In this case the light-curve cannot be easily modelled with a two-component fit (as detailed by O'Brien et al. 2006 and Willingale et al. 2007), indicating the requirement for an additional component. Some GRBs show what is known as a precursor: that is, there is an increase in gamma-rays before the main explosion. Swift triggered on such an event for GRB 061121, allowing both the XRT and UVOT to observe the main prompt emission as shown in the figure below. At the time of discovery, GRB 061121 was the instantaneously brightest long Swift burst, though this record has since been beaten by GRB 080319B (Racusin et al. 2008), which displayed both the brightest optical and X-ray fluxes ever measured for a GRB - and would even have been visible to the naked eye!